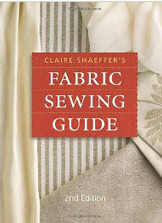 Claire Shaeffer’s Fabric Sewing Guide – Hands down this is the most used book on my sewing shelf. I reach for it primarily when I’m planning a new project with a fabric I haven’t sewn with before or sewing a tricky fabric that needs to be handled with care. This comprehensive guide will ensure you are using the right needles, notions, and stitching techniques on the right fabric. It also includes great troubleshooting advice for working with tricky fabrics from fabric prep and cutting tips to seam finishes and hem applications. The Sewing Book by Alison Smith – I am a visual learner, so this hefty technique guide wins points from me because everything is shown in big full color step-by-step photographs. I can look at the photos and know exactly how what I’m doing should look like on that step. I use the book to assist me with techniques that are hard to visualize with just written directions and to review lots of technique options for changing or creating a pattern. Particularly ideal for garment sewers, whether you are putting in facings, setting in sleeves, or sewing a lining, this book shows you all the essential techniques you need to make almost anything. 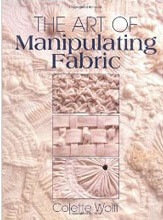 The Art of Manipulating Fabric by Colette Wolff – If you want to get creative with your sewing this unique book shows how much you can do by experimenting with fabric manipulation and three-dimensional fabric effects such as gathering, shirring, ruffling, tucking, pleating, weaving, quilting and more. I turn to this book for interesting techniques that can turn a simple project into something extraordinary. Now, don’t let the black and white photographs and text-heavy design scare you away from this book. There is a wealth of information here that you won’t find anywhere else. 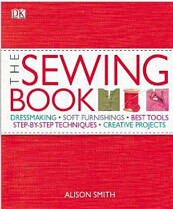 If you are an adventurous sewer looking for new ways to work with fabric, then this book is for you. Do you have these books on your shelf? How do they work for you? In the comments feel free to add to my list and recommend your favorite general sewing reference books. I own the Shaeffer (older edition) and Wolff books. The Wolff book is great, but it requires the sewer to know how to apply the demonstrated techniques to a garment. The Reader’s Digest Guide to Sewing ( I own an older edition). The new one looks fine, although it has a different focus and suggests projects. The Dorling Kindersley Complete Book of Sewing (great photos; the new edition looks even better). Both editions of Shaeffer’s Couture Sewing and her DVD,Couture Sewing Workshop Basics (?). Couture methods can be helpful even to beginners because they provide more control. The DVD shows how to start and end a line of hand sewing and various stitches. For someone actually wanting to use the books as a guide, the new edition is preferable. The Sewing Bible (a little book that can be easily carried). Roberto Cabrera, Classic Tailoring Techniques: A Construction Guide for Men’s Wear. (Considered the standard reference in English.) There’s a Women’s Wear version that covers different things, but I haven’t bought that yet. It’s extremely helpful to take an excellent class if one is available. People learn much faster when they watch and have their work reviewed by experts — people who have sewn or designed or made patterns in a professional capacity. What about any recommendations on books designed for young beginner sewers aged 8-12 or so? I’ve found two, but am unimpressed. I’m just wondering if there is something you’d recommend. My niece is getting a sewing machine, but her mother doesn’t sew. While I sew, I sort of “free-hand it”. Thanks! I found the Claire Shaeffer’s book at a used book store, and it really is a gem. I love the index- I can find what I need to know in a heart beat. When I’m hunting for fabric online, it gives me a great idea of what I can, and can’t use the fabric for.